On the afternoon of October 27th, a militarized police force of more than 100 officers responded to, raided, and arrested over 140 members of a resistance camp lying directly in the path of the proposed $3.8 billion Dakota Access pipeline, on the Standing Rock Indian reservation in Cannonball, North Dakota. Using concussion grenades, rubber bullets, and shotguns armed with bean bag rounds, the responding police force shot at, bruised, bloodied and injured the steadfast water protectors of the resistance camp. The advancing police were clad in “riot gear with automatic rifles lined up across North Dakota’s highway 1806, flanked by armored personnel carriers, a sound cannon, Humvees driven by National Guardsmen, an armored police truck, and a bulldozer.” The officers were more than equipped to engage in battle with a small army. Was all of this really necessary for a large group of unarmed Native Americans asking to protect their sacred lands and clean water? This latest flare up of confrontations between water protectors and law enforcement comes more than a month after the September 3rd incident near Lake Oahe, where “security guards working for the Dakota Access pipeline company attacked Native Americans with dogs and pepper spray” who were attempting to stop company tractors already in the process of demolishing a sacred burial site. In response to the attacks, on September 9th the US Departments of Justice, Interior, and Army Corps of Engineers, backed by the Obama Administration, stepped in requesting “that the pipeline company voluntarily pause all construction activity within 20 miles east or west of Lake Oahe”—some 40 miles north of the Cannonball resistance camp. It was later found by the Morton County Sheriffs that the company guards were without the proper licenses to do security work in North Dakota, according to Democracy Now. The Dakota Access pipeline stands as a very real threat, not just to the local Native American land in North Dakota, but to every community in its path. Once constructed, the pipeline “would carry over about 500,000 barrels of crude [oil] per day from North Dakota’s Bakken oilfield to Illinois,” according to Democracy Now. “Since 2009, the annual number of significant accidents on oil and petroleum pipelines has shot up by almost 60 percent, roughly matching the rise in U.S. crude oil production, according to an analysis of federal data by The Associated Press,” reports the Chicago Tribune. If it’s more information you want about the Dakota Access pipeline, don’t run to your cable news network. 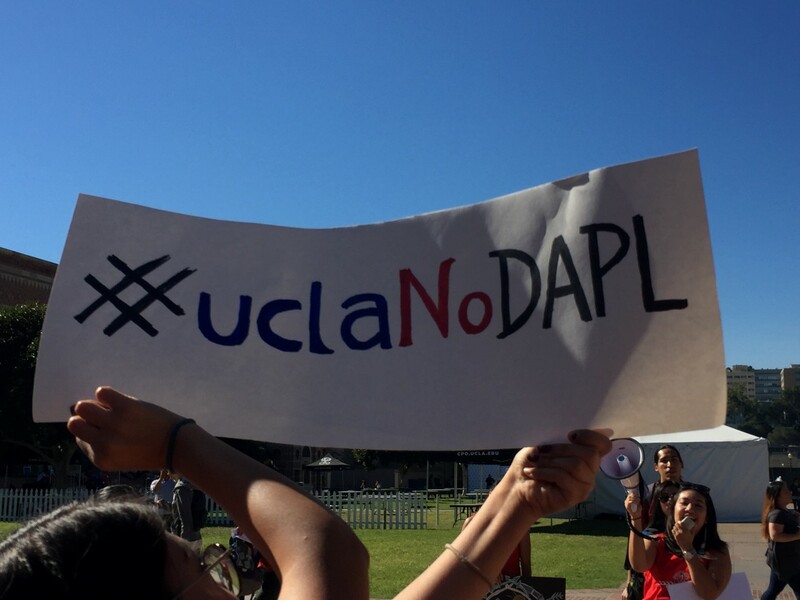 Sadly, most UCLA students have only heard about the violence in Standing Rock from friends or on social media. Tiana Austel, a 4th year student, stated that she hasn’t “seen it on any major news outlets.” Most of what she hears about the Dakota Access pipeline comes through her food studies courses and philanthropic circles. Other students agreed that there was a lack of mainstream coverage on the events taking place in Standing Rock. “It’s not getting enough coverage,” says Karla Duarte, a junior transfer. She stays informed through friends and online articles posted on social media because the “news is being really biased.” Her friend, Samantha Gonzalez, said she only heard about the Dakota Access pipeline through social media as well. When most major news networks are silent on the violence in Standing Rock, water protectors and other activists have found hope through other means to tell the world about what’s really going on in North Dakota–#NoDAPL!